I went to Sydney for the weekend with some friends. The main aim of our trip was to watch the absolutely fabulous Mardi Gras parade, which, you'll be pleased to know, was brilliant. For me, however, a trip to Sydney will always be primarily a culinary experience. We arrived in the early afternoon, and after checking in, I went to get my nails done. 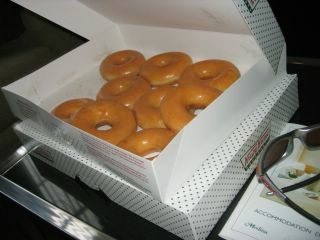 I returned about an hour later, and found to my absolute delight, that my friends Jay and Josh had already done a Krispy Kreme run. 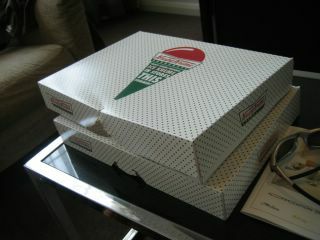 We had 2 boxes of assorted, and 1 box of original glazed (these are the best) sitting in our hotel room. Rock on! Assorted dozen - The only flavoured Krispy Kreme donuts I like are the chocolate ones. But original is surely the best. 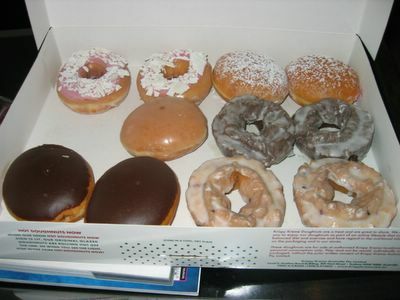 I must have eaten about 5 whole donuts that first day... I kept splitting them in half sharing them with Josh. Because as you know, if you share food, it's not fattening at all. I am one lucky plonker!